It’s always a nice surprise to find yourself as an author… especially when that find is on the Horror Writer Association’s book marquee! I happened by the site today looking for details on the upcoming HWA Poetry Showcase and I spied Bitter Suites scrolling by alongside some of the best books in the genre. You can visit the site yourself at Horror.org. Be sure to check out the great line up they have. 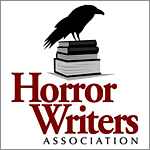 From their website: THE HORROR WRITERS ASSOCIATION (HWA) is a nonprofit organization of writers and publishing professionals around the world, dedicated to promoting dark literature and the interests of those who write it. HWA was formed in the late 1980’s with the help of many of the field’s greats, including Dean Koontz, Robert McCammon, and Joe Lansdale. Today——with over 1250 members in countries such as Australia, Belgium, Brazil, Canada, Costa Rica, Denmark, Germany, Honduras, India, Ireland, Israel, Italy, Japan, Netherlands, New Zealand, Nicaragua, Russia, Spain, South Africa, Sweden, Taiwan, Thailand, Trinidad, United Kingdom and the United States——it is the oldest and most respected professional organization for the much-loved writers who have brought you the most enjoyable sleepless nights of your life. One of HWA’s missions is to encourage public interest in and foster an appreciation of good Horror and Dark Fantasy literature. To that end, we offer the public areas of this web site, we sponsor or take part in occasional public readings and lectures, we publish a blog and produce other materials for booksellers and librarians, we facilitate readings and signings by horror writers, and we maintain an official presence at the major fan-based horror and fantasy conventions, such as the World Fantasy Convention and the World Horror Convention. HWA is also dedicated to recognizing and promoting diversity in the horror genre, and practices a strict anti-harassment policy at all of its events. As part of our core mission, we sponsor the annual Bram Stoker Awards® for superior achievement in horror literature. Named in honor of the author of the seminal horror novel Dracula, the Bram Stoker Awards® are presented for superior writing in eleven categories including traditional fiction of various lengths, poetry, screenwriting, graphic novels, young adult, and non-fiction. In addition, HWA presents an annual Lifetime Achievement Award to a living person who has made significant contributions to the writing of Horror and Dark Fantasy over the course of a lifetime.